Global trade is in trouble: protectionism is on the rise, shipping companies are going bust and giant trade deals are on the rocks. It's a trend that poses a real challenge to world leaders as they prepare to meet at the G20 summit in China this weekend. 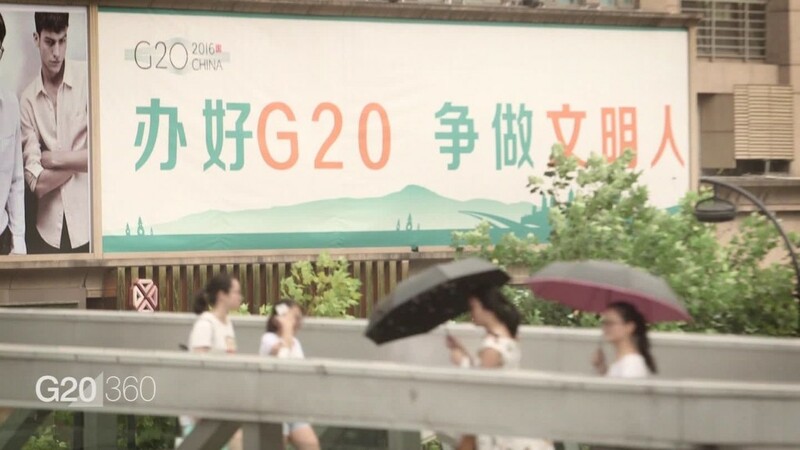 Beijing finds itself in a particularly tight spot: It's both the host of the G20 summit and the target of much of the anger over the effects of free trade on people around the world. "It is hard to find a country that has benefited more from trade than China," said Natixis economist Alicia Garcia-Herrero in an article for the think tank Bruegel. "Protectionism is ... one of the major risks to China's successful economic transition." The global rise in protectionist rhetoric is typified by U.S. presidential candidate Donald Trump. And China faces continued criticism from the U.S. and Europe over the flood of steel and other raw materials it has unleashed on global markets. The growing phobia of free trade in Western nations has already put two huge deals in jeopardy. China isn't involved in either, but it's signed a string of trade agreements with other countries in recent years and is pursuing more. Related: At Obama's last summit, does the G20 still matter? 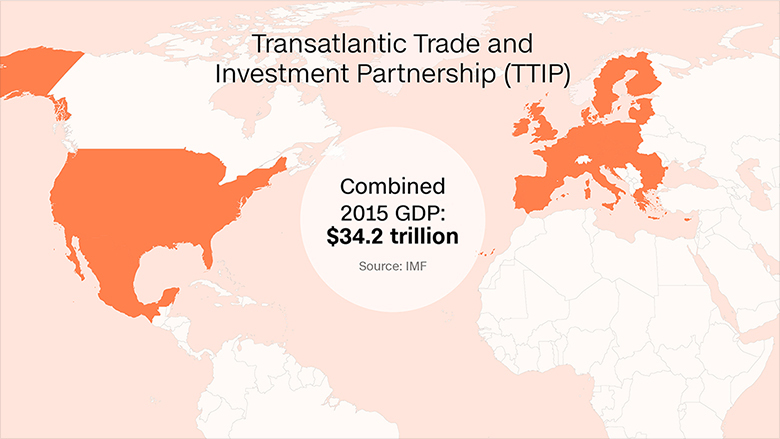 Official name: The Transatlantic Trade and Investment Partnership (TTIP). 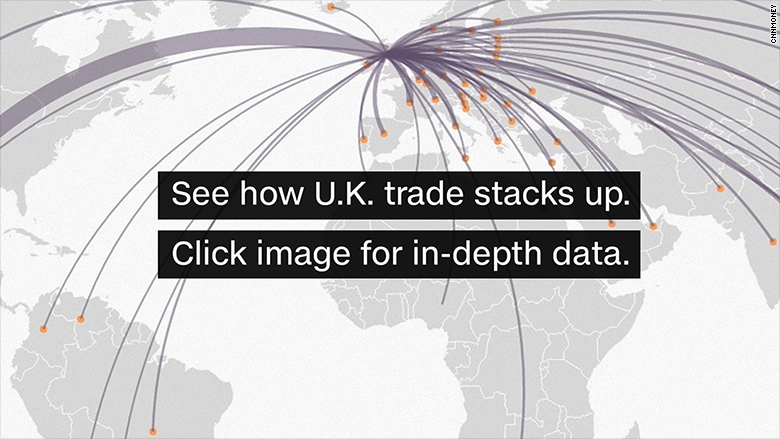 Who's involved: The U.S. and the 28 members of the European Union. Total GDP: $34.2 trillion (47% of world GDP). In favor: The agreement "will help unlock opportunity for American families, workers, businesses, farmers and ranchers through increased access to European markets," the U.S. government says. The European Commission says it would be worth 545 euros ($620) to each European citizen every year. Against: European labor unions and pressure groups argue the deal will give too much power to big U.S. corporations because it would make it easier for them to sue governments over laws they claim hurt their business. There are also concerns about its possible impact on public services, food safety and environmental protection. And there's anger that the talks are being held in secret. Current status: A top German official said this week that talks over the deal were "de facto dead." France has called for them to be halted. The European Commission insists it's still making progress, but Britain's vote to leave the EU has further complicated matters. TTIP talks began in June 2013, and negotiators originally hoped for a deal before Obama leaves office in January. But that looks a tall order now. Official name: Trans-Pacific Partnership (TPP). Who's involved: The U.S. and 11 other nations dotted around the Pacific Rim: Australia, Brunei, Canada, Chile, Japan, Malaysia, Mexico, New Zealand, Peru, Singapore and Vietnam. Total GDP: $27.4 trillion (37% of world GDP). 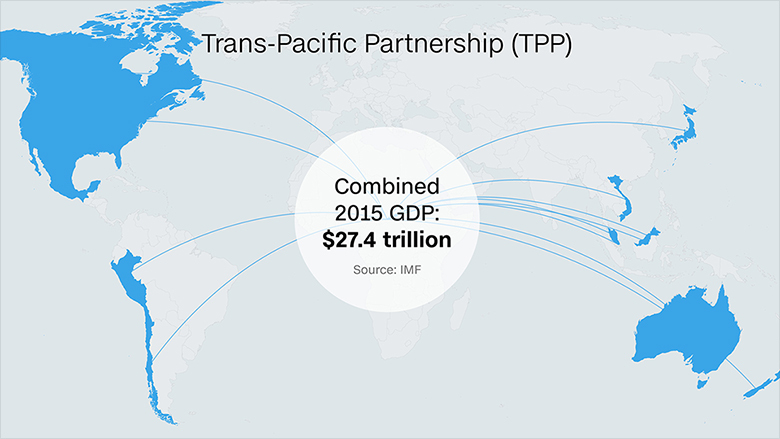 In favor: Some economists say the TPP will boost income in the participating countries. Advocates in the U.S. say it will lift exports and support well paid jobs. U.S. Treasury Secretary Jack Lew said this week that it "puts in place historic labor and environmental standards that ensure our trading partners play by our rules and values." Against: Other experts say the deal will kill jobs and worsen income inequality across the 12 nations, particularly in the U.S. Critics argue it will only help big corporations and not ordinary citizens. "The advocates of trade said it was going to benefit everyone. The evidence is it's benefited a few and left a lot behind," said Joseph Stiglitz, the Nobel laureate economist. Current status: The agreement was signed in February, but it has to be ratified by all 12 countries. Obama is hoping to get the deal through Congress before he leaves office. But that's unlikely to happen. Both Trump, who has called the TPP "an attack on America's business," and his Democratic opponent, Hillary Clinton, have spoken out against it.